Returning to the side after illness, Ollie was asked to play in a more advanced midfield role after a half-time break that saw Rovers go in slightly fortuitously level. The number 8 scored a lovely goal that seemed like it would earn the Gas three massive points in the fight for SkyBet League One survival. However, bottom side Bradford struck late on, with captain Nathaniel Knight-Percival converting from a set-piece, and seemingly had grabbed a point. 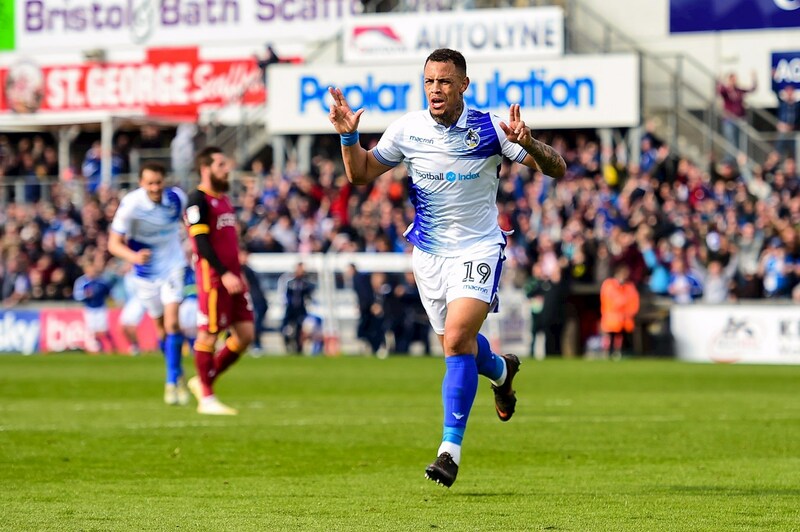 In injury time, though, Clarke-Harris scored his 11th goal of the season – and perhaps his most important yet. Tareiq Holmes-Dennis was recalled to the starting line-up at the expense of Michael Kelly, with Ollie Clarke returning to the midfield following illness. Stuart Sinclair was the man to make way for Ollie, named Rovers Player of the Year in midweek. The final change saw Tom Nichols recalled to the front two, with Gavin Reilly missing out. On the bench, there was a welcome return for Alex Rodman. It took 12 minutes for either side to fashion a chance of note. A left-wing corner was taken short and worked well by Bradford to give Jack Payne a chance for a shot on the run, which he caught well enough, but Jack Bonham saved well, low down. Shortly afterwards, the same player was causing hassle again. Getting to the bye-line, Payne’s low centre was kicked away by Bonham, but James Clarke dallied in making a clearance, was pickpocketed by Lewis O’Brien, and O’Brien struck through a clutch of players to give Bradford the lead. The Bantams were on top, and O’Brien got another ball past Bonham, but this time found Tony Craig covering, but Rovers looked on the ropes at an early stage. Tom Nichols got Rovers’ first shot on goal at the first half’s midway point, but slick as his one-two with Jonson Clarke-Harris was, the shot was an easy one for Richard O’Donnell to gather. Eoin Doyle, Bradford’s experienced frontman, had two chances, one deflected wide after the ball was rather presented to him, then an even better block as he beat the offside trap then cut inside dangerously. On 36 minutes, the first real Rovers chance, and it came out of the blue. Liam Sercombe hit one from 20 yards, and the dip and pace nearly caught out O’Donnell who scrambled well to push it wide. From the corner, Sercombe’s delivery found Clarke-Harris criminally unmarked, and the Gas marksman made no mistake, powering a header to move him to double figures for the season – already. Suddenly, observers were watching a rejuvenated team, which in turn sparked Gashead noise. 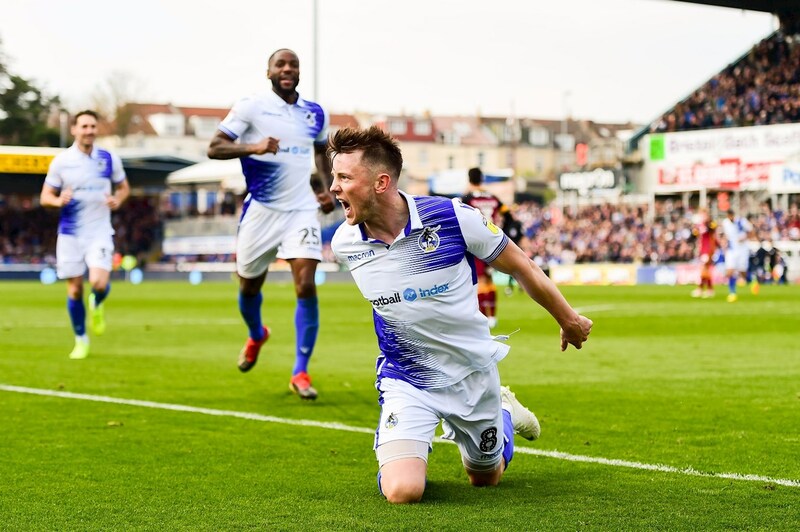 Another well-delivered corner met Tom Lockyer’s well-timed run, and his glanced header somehow stayed out, because of – or in spite of – Bradford’s panicky attempts to prevent it. Clarke-Harris was hardly lacking in confidence before his goal, but after it he looked unplayable. A chest down and ambitious shot that went not far over was the last action of a first half that Rovers had been second best in for over half an hour, but found themselves level, and with the momentum. Inside four minutes of the second half Clarke-Harris was winning another flick-on, and the ball was spread to Sercombe. He cut inside on to his right foot, and delivered an inviting cross. So inviting, in fact, it attracted O’Donnell and Clarke-Harris; the Rovers man met it first, but his header hit the bar and went over. Graham Coughlan’s half-time chat involving a tinkering of the midfield, altering the shape to pull Liam Sercombe and Tom Nichols to the flanks, and push Ollie Clarke further forward. Rovers’ spring in their step matched the sense of spring in the air. A long throw-in by James Clarke was partially cleared, then brilliantly controlled by Abu Ogogo, whose volley was not powerful, but also dipped not far over the bar. 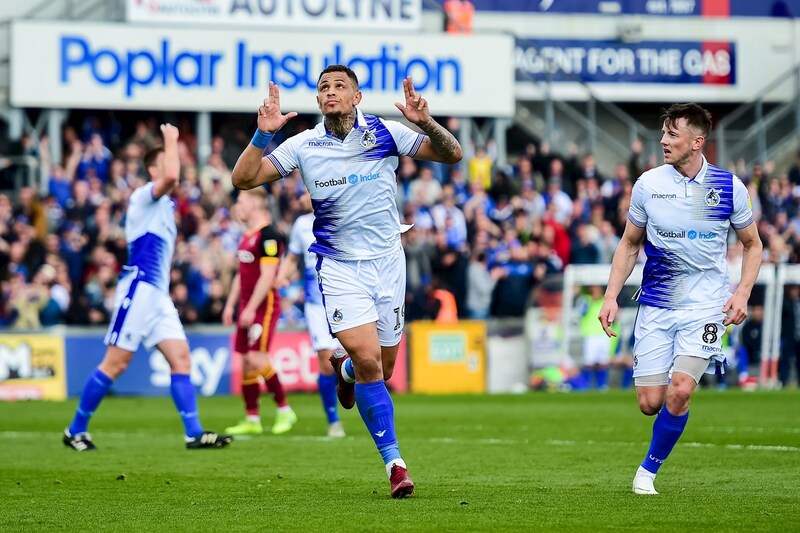 By the mid-point of the second half Rovers had three men in the book – Sercombe, Ed Upson and Ogogo for three of the clearest bookings you are ever likely to see. From the last, Ogogo’s, Bradford worked a short free-kick, with a cross that was punched partially away by Bonham. Sean Scannell picked up the loose ball inside the area, but thankfully enough bodies were between him and the goal, and his effort was blocked. With both teams knowing a win was paramount, each played accordingly, searching for a second, and thus the game between stretched, and end-to-end. O’Brien got a shot on target, saved by Bonham, at one end, with Ollie Clarke forcing O’Donnell into action at the other end. Rovers brought on Alex Rodman for Nichols, changing personnel but not shape. What did change, very quickly, was the score. Ollie Clarke, having got his range, tried one from 25 yards, and saw the ball curl into the corner of the net – an excellent finish from the Player’s Player of the Season. Soon after, Ollie was replaced by Stuart Sinclair, and received an unsurprising ovation. Bradford, though, with their survival at stake, fought back. A barrage of balls in the area seemed to have been dealt with, but Knight-Percival did a skipper’s job of hooking home in the box, and looked like he would return to Yorkshire a hero. However, he reckoned without The Gas’ own double-barrelled superstars. Tareiq Holmes-Dennis powered into position on the left flank, and fired a cross to where Clarke-Harris was waiting to smash home with a glorious first-time effort. Rovers XI: Jack Bonham (GK); James Clarke, Tom Lockyer (c), Tony Craig, Tareiq Holmes-Dennis; Abu Ogogo; Ed Upson, Ollie Clarke (Stuart Sinclair 81), Liam Sercombe (Alex Jakubiak 90); Tom Nichols (Alex Rodman 71), Jonson Clarke-Harris. Unused Subs: Adam Smith (GK), Gavin Reilly, Joe Partington, Alfie Kilgour. Booked: Sercombe 31, Upson 56, Ogogo 66. Bradford XI: Richard O’Donnell(GK); Paul Caddis, Nathaniel Knight-Percival, Paudie O’Connor, Adam Chicksen; Josh Wright, Jacob Butterfield; Sean Scannell (George Miller 74), Jack Payne, Lewis O’Brien; Eoin Doyle * Billy Clarke 77). Unused Subs: Ben Wilson (GK), Anthony O’Connor, Jermaine Anderson, Hope Akpan, Daniel Devine.